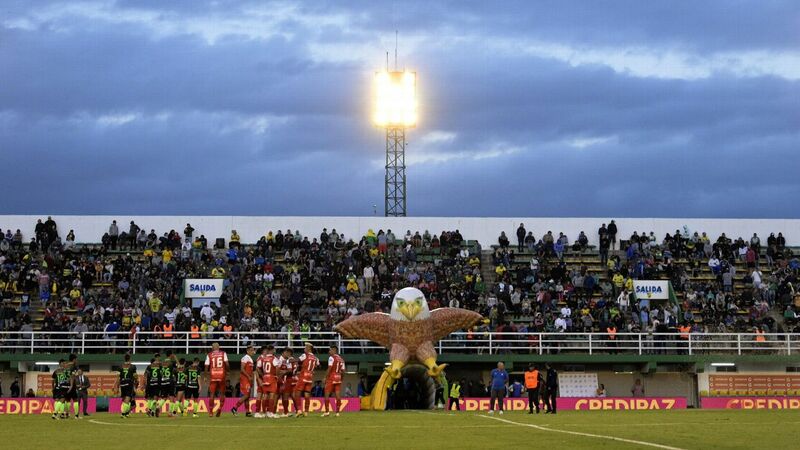 Can tiny Defensa overcome Racing in Argentine title race? We have quickly hurtled to the midway point of the Nigeria Professional Football League, and Lobi Stars are setting a pace as breathless as the speed with which the competition is racing to what should be a record finish. This past matchday was no different as the action continued all the way to Monday evening, highlighted by the smothering of league top scorer Junior Looks for another week, and pockets of undesirable assault at one venue. Super Eagles goalkeeper Ikechukwu Ezenwa has been out injured for nearly three weeks. In his absence, Ghanaian stopper Fatau Dauda has held the fort for Enyimba and done an impressive job of it, including helping the People's Elephant to qualification for the group phase of the CAF Confederation Cup. But Paul Aigbogun wasted no time in throwing the Nigeria goalkeeper back into the thick of the action against Wikki Tourists, and how he justified his selection. Samuel Kalu's free-kick was arrowing into the top corner until Ezenwa's intervention. He followed that up by sprinting off his line to deny Shammah Tanze -- twice -- before pulling off another unbelievable effort from close range following a goalmouth scramble. And that all inside the first 45 minutes. While the game petered out in the second half, Ezenwa still had time to pull off two more stops as Enyimba held on for a well-deserved 0-0 draw in Bauchi. The Eagles goalkeeper was voted Man of the Match, and there was none more deserving. Heartland are bottom of the table, and this weekend's 1-1 draw at home to Plateau United did little to change their course of a quick return to the lower division. Those two points they dropped at home were galling. To drop them with virtually the last kick of the game was especially gut-wrenching. A few more seconds and Heartland would have been up to 17th on the log, but it was not to be as Tosin Omoyele cancelled out Abiodun Thomson's 21st minute strike. And that was enough to ignite the sparks. Fans, alleged to be Heartland-supporting, went crazy, physically assaulting the match officials and leaving the referee with serious injuries. It was behaviour unbecoming of a club of Heartland's stature or of their fans; behaviour that the LMC will do well to come down hard on. As things stand, Heartland will be hard-pressed to survive the drop. But they are using every last shred of dignity they have with these sort of actions from their fans. International defender Kalu Orji arrived at Kano Pillars from Rangers to replace the recently departed Chinedu Udoji. He arrived with a reputation as a tough, uncompromising centre-back, so it was no surprise his debut was against the equally unyielding league leaders. Although he did not fold under pressure, Orji was not exactly the picture of decisive defending either. It was a largely subdued performance as Lobi ran away 1-0 winners; Ayo Saka scoring the winner with nine minutes of play left. While Orji was having a quiet time at one end, his opposite numbers were enjoying a field day pocketing the Pillars strikers at the other end. So much so that league leading scorer Junior Lokosa was subbed after failing to so much as get a shot on target due to the close attentions of Umar Zango.